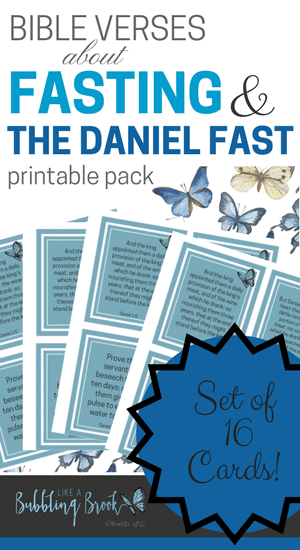 Deepen your Daniel Fast with these cards you can print and carry with you! This printable scripture card pack includes 16 powerful bible verses about fasting, with an emphasis on The Daniel Fast. Print these cards on card stock paper or laminate them and carry them with you throughout your day! These reminders will help you be purposeful with your fasting and encourage you to make wise, God-honoring choices during this time of renewal. This will be delivered to you as a PDF download, and will arrive attached to the receipt you get via email.